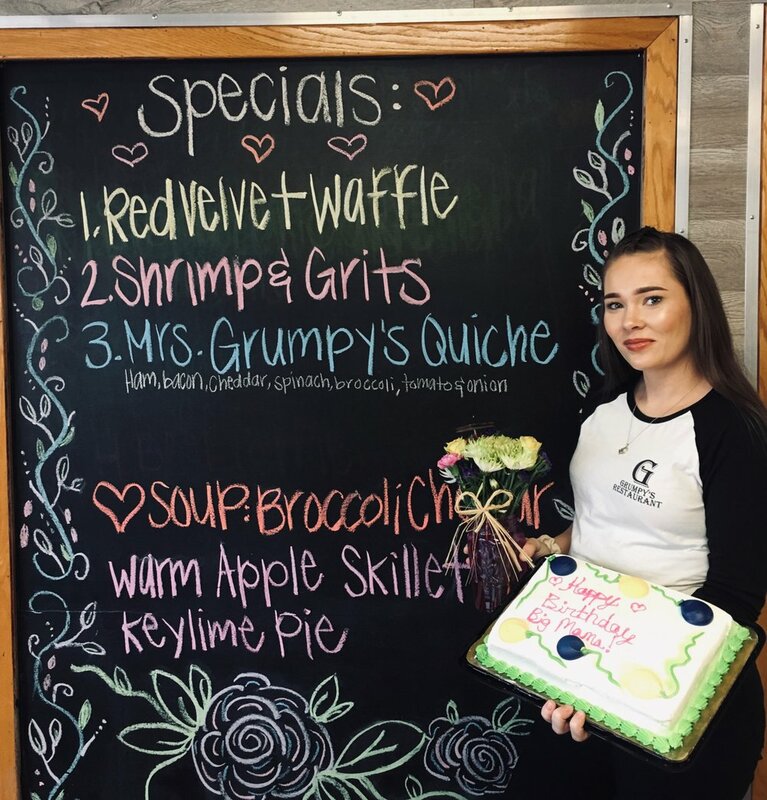 Meet Angie, she recently celebrated her 1 Year Anniversary with Grumpy's Restaurant and her Birthday! Angie is the “Boss” of our Front of House! Her work ethic and commitment to an excellent guest experience is second to none. 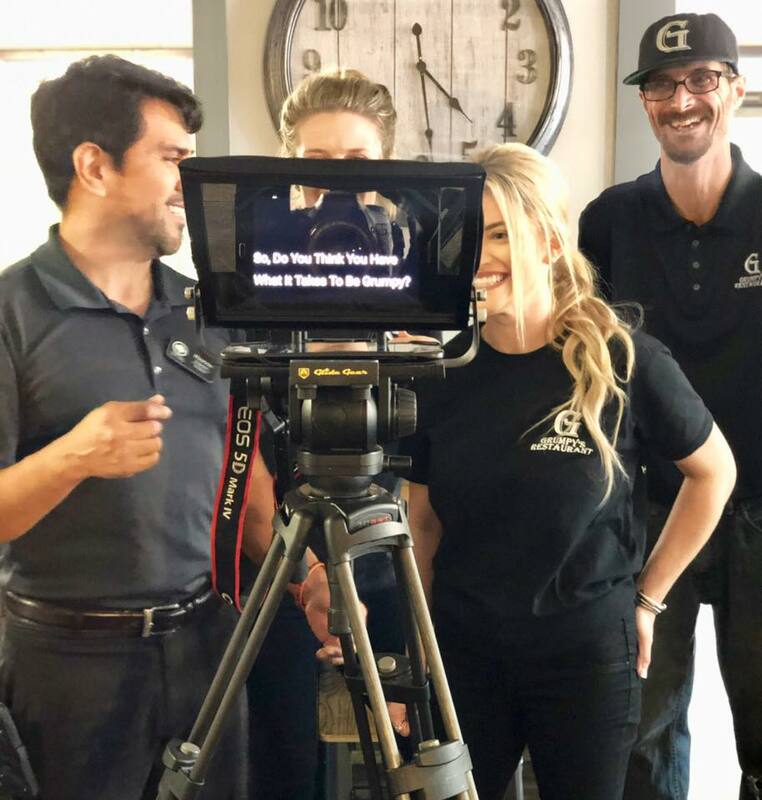 Angie loves to spend her off time off making memories with friends, family, and most of all with her daughter Alexius, son Guy and Husband Buddy. The most enjoyable part about her job at Grumpy’s Restaurant is getting to greet all of our customers daily. Thank you for your continued hard work and being a key part of our Grumpy's Family. Cheers to more great years! Meet Linda, today she celebrates her Birthday and 10th Anniversary with Grumpy's Restaurant! Linda's work ethic and commitment to an excellent guest experience is second to none. Linda loves to spend her off time with her daughter and grandson, Jacy. The most enjoyable part about her job is seeing the children grow up of our long time guest. Thank you for your continued hard work and being a key part of our Grumpy's Family. Cheers to another 10 great years! Meet Victoria, she is one of our beloved serves. She recently returned from maternity leave, celebrated her birthday and the birth of her first child! Victoria loves to spend her off time with her beautiful newborn baby girl Willow and boyfriend Sean. The most enjoyable part about her job is being back serving our great customers and working with her coworkers again. Grumpy welcomes you back, wishes you a happy birthday and thanks you for all your hard work and dedication Victoria! Our employees come from diverse backgrounds and are constantly finding ways to make Grumpy's Restaurant better and better. Meet Courtney, she is one of our Managers in Training, Team Leaders and one of the many people who helped Grumpy's win Jacksonville's Best Restaurant & Best Breakfast 2018! Courtney recently celebrated her Birthday! She likes to spend her off time with her two beautiful children and husband Chad the Man. The most enjoyable part about her job is building relationships and friendships with our amazing customers. Grumpy thanks you for all your hard work and dedication Courtney! Our employees come from diverse backgrounds and are constantly finding ways to make Grumpy's Restaurant better and better. Meet Taylor, she is one of our leaders and one of the many people who helped Grumpy's win Jacksonville's Best Restaurant & Best Breakfast 2018! Taylor recently celebrated here one year anniversary with Grumpy’s Restaurant and her Birthday! She likes to spend her off time with her two beautiful children and husband Matt. The most enjoyable part about her job is hanging out with 40 Marines every Monday morning. Grumpy thanks you for all your hard work and dedication Taylor! It’s that time of the year again to come in from the cold and take the chill off with a warm cup of Grumpy’s Homemade Hot Chocolate! There is nothing better than a decadent and creamy homemade hot chocolate made with Hersey’s chocolate, spices and whole milk. Grumpy would like to thank everyone who voted for us! Our customers are truly the best!